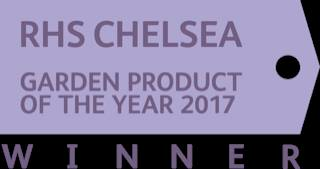 'Pure Elegance, Seamless Strength', the Pure Frameless Greenhouse range is a stunning addition to any garden and was a worthy winner of the RHS Chelsea Flower Show Product of the Year in 2017. 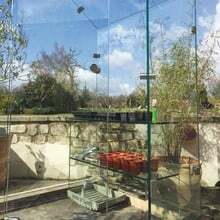 The Pure Frameless Greenhouse is the world's first truly frameless greenhouse, a beautiful alternative to traditional aluminium framed greenhouses. The Pure range uses a frameless glass structure made from 10mm glass with 100% stainless steel fixings and brackets. 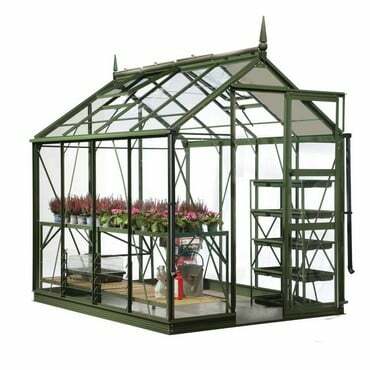 The unique design of the greenhouse allows maximum light to reach your plants. 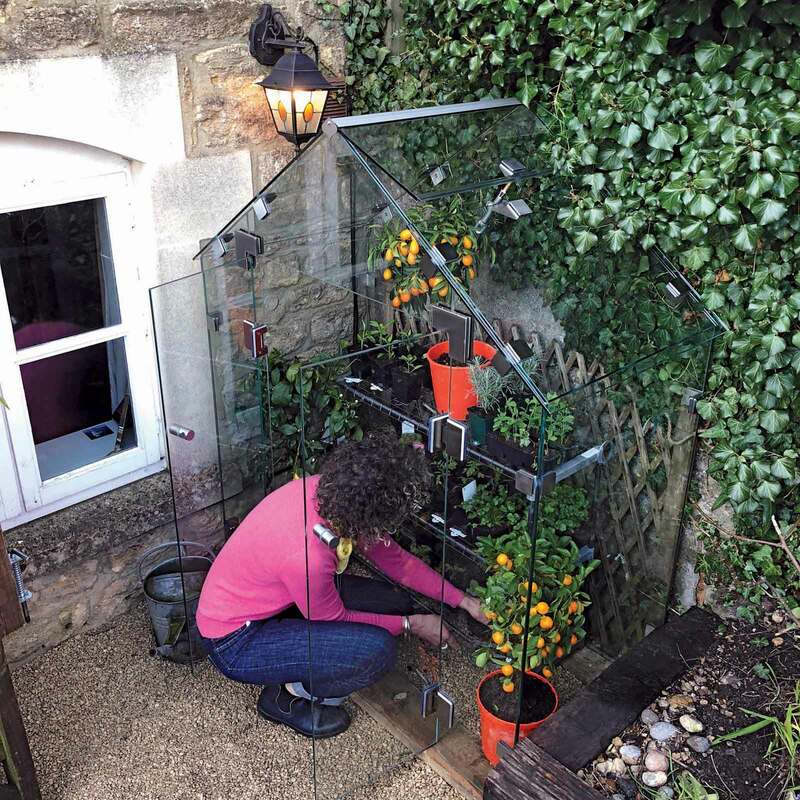 The Pure Greenhouse features an innovative full ridge glass ventilation system which offers maximum ventilation. There are also 8 smaller vents at lower level and double doors to provide numerous ventilation options. 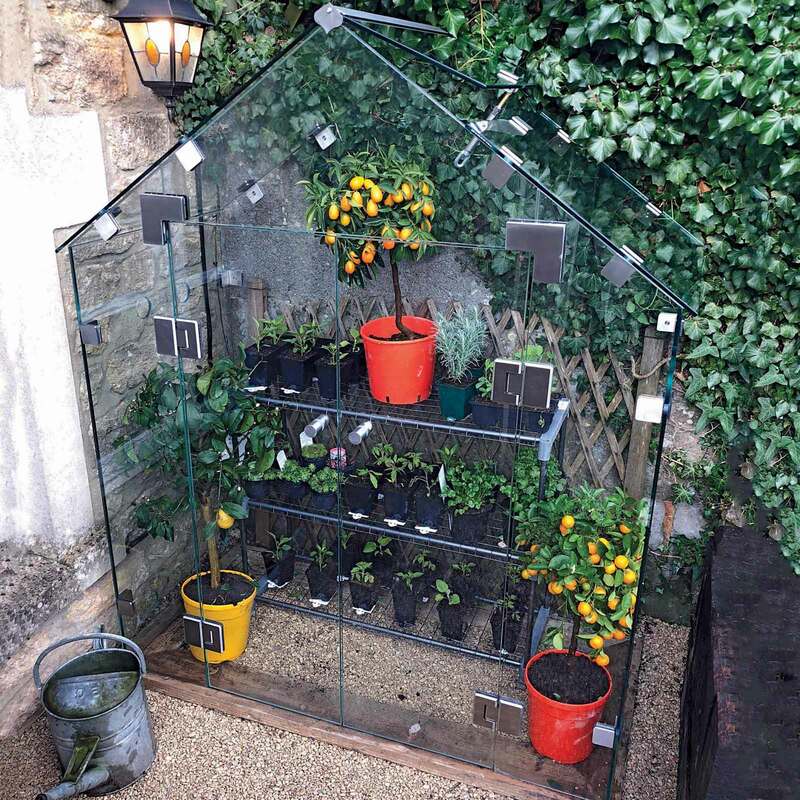 Along with fantastic ventilation the greenhouses also have good thermal qualities with its 10mm thick glass and the fact that the structures is totally sealed when all vents are shut making it ideal for winter growing. The frameless garden greenhouse is also easy to clean, with a totally seamless interior you can sterilise and clean it in minutes with no crevices or frame for creepy crawlies to hide. A transparent shield is applied to your greenhouse glass, giving it a hard and durable water repellent and non-stick surface to help keep your greenhouse clean. The doors also have no threshold so there are no trip hazards or access restrictions for your wheelbarrow. The Pure Range is available in 5 sizes to suit any garden, from the Pure Mini, perfect as a mini greenhouse or cold frame where space is at a premium, to the Wysteria 6ft x 8ft which provides a substantial growing space. Installation is included in the price and you will be contacted to arrange a convenient time for delivery and installation. 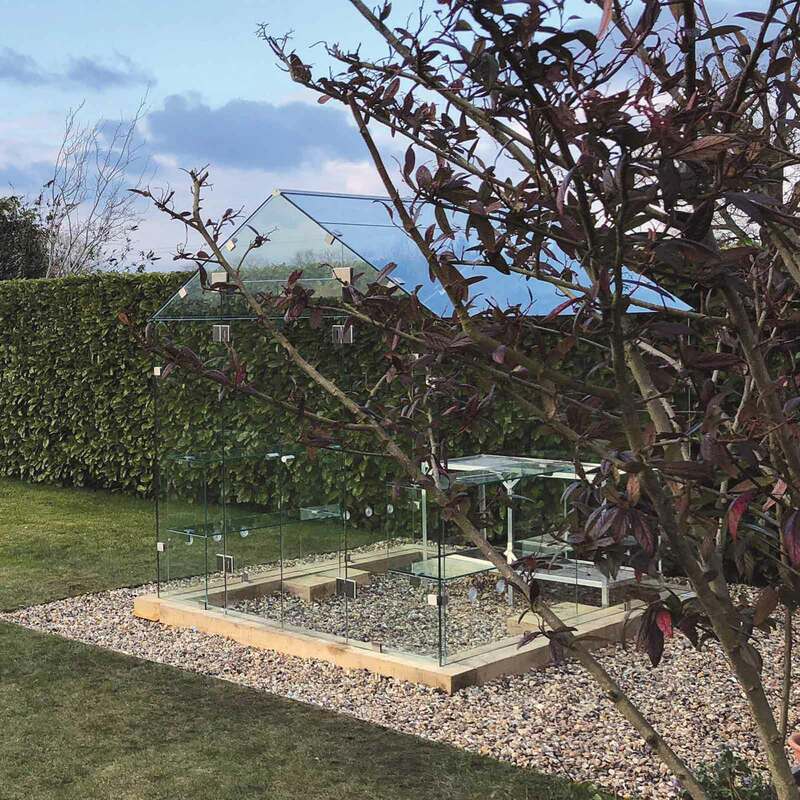 The Greenhouse can sit directly onto a flat, permanent level surface, or we can recommend using our Oak Base - please contact us for a quote. This product is exempt from promotions, discounts and express delivery. The Pure Greenhouse can sit directly onto a flat, permanent level surface if you have a garden that can accommodate it. If you don't have a flat permanant surface for your greenhouse we do advise using an oak base for the greenhouse - please advise us of the size greenhouse you require and we can obtain a quote for the base. The Oak Base really sets off the greenhouse and allows us to fit to most un-level surfaces. The green oak base will last 30 years as an absolute minimum and has been known to last over 100 years depending on the surrounding environment. During the testing phase, one of the greenhouses was placed on top of the Mendip Hills, near a local weather station. During hurricane Katie the greenhouse withstood prevailing winds of 80mph with gusting winds well in excess of 100mph. 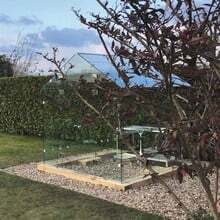 The glass used is 10mm thick and incredibly strong, unlike conventional greenhouses you wouldn’t be able to kick a football through a Pure Greenhouse.